North Korea has issued another threat of war over the drill. It said it was prepared to launch a pre-emptive strike in response to any sign that an invasion was being prepared. According to the US Naval Institute journal, officials said the US Navy was tracking the submarine when it suddenly disappeared. 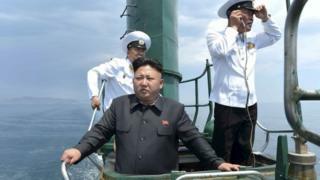 It says the North Korean military operates a fleet of about 70 submarines ranging in sizes. The US military had observed the North Korean navy searching for the missing submarine, CNN reports. BBC Korea correspondent Stephen Evans says North Korea has two submarine bases on the eastern coast, facing Japan, and the submarine was thought to have been operating near these bases. If the North Korean submarine has sunk, it is not known if its difficulties were connected to the current stand-off between North and South, our reporter says. Security tensions have increased since the North tested a nuclear device in January. Can South Korea defend itself? Dealing with the North: Carrots or sticks? Earlier this week, North Korea fired two short-range ballistic missiles into the sea a few days after threatening to launch a "pre-emptive nuclear strike of justice" against the US and South Korea. North Korean leader Kim Jong-un also claimed scientists had developed nuclear warheads small enough to fit on ballistic missiles. Many analysts think this capability could still be several years away. Carrots or sticks to take on North Korea?